In a country that is changing as fast as Laos, it can be comforting to see many traditions standing the test of time. 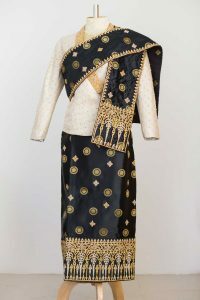 The Lao sinh, a traditional garment regularly worn by Lao women from north to south, is a most vivid example. 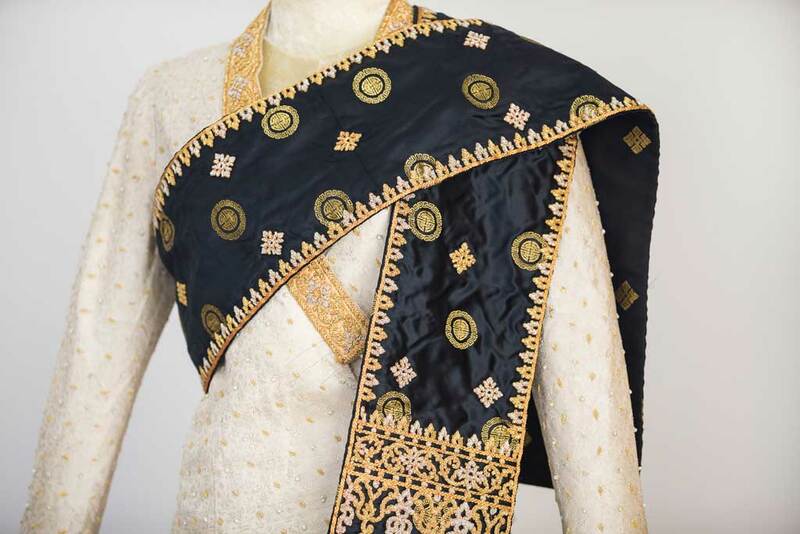 A sinh will usually adhere to a single, common design – a tailored, mid-calf skirt that folds over on itself (for ease of movement), with an embellished, contrasting band across the bottom. But the particular combinations of colour, fabric and texture are seemingly endless. No two sinhs are alike, and styles are constantly changing. Things were not so different a century ago, in the royal court in the ancient kingdom of Luang Prabang. 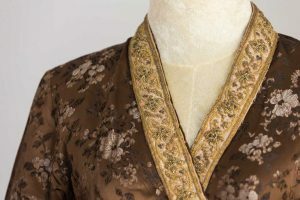 The Queen herself, along with her daughters and surrounding noblewomen, all wore some variation on the traditional sinh, though the silk may have been finer, and the embroidery more intricate. 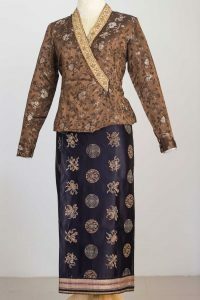 This outfit, worn 100 years ago by a member of the royal family in Luang Prabang, and now part of the private collection of Kualao restaurant, has a embroidered band around the collar of the tailoured silk jacket that was distinctive for nobility; those of common stock did not use such an embellishment. But, a century later, young Lao brides are still opting for traditional ensembles that would have befitted the former royal family. This example, from a 2012 Vientiane wedding, is a perfect reconstruction of a formal royal outfit, but with a modern twist – eye-catching gold buttons and a heavily embellished black silk sinh.